MIT researchers have developed a new surgical technique that makes prosthetic limbs feel like real limbs. It could also help reduce the rejection rate of prosthetic limbs. The researchers worked with rats, successfully generating muscle-tendon sensory feedback to the nervous system. The feedback helps relay information about the placement of prosthetic limbs and the forces applied to it. Now they hope to use that same method in humans. During amputation, muscles are cut in a way that removes the person’s sense of limbs in space. Muscle pairs called agonist-antagonist control limb movement. Without them, people who have had amputations cannot sense where artificial limbs are placed or the amount of force being put on them. “They have to visually follow their hands or their limbs because there isn’t any feedback from the device or residual limb that tells their brain where their prosthetic limbs are in space,” Shriya Srinivasan, a graduate student in the Harvard-MIT program in health sciences and technology and lead author on the study. MIT researchers wanted to recreate the agonist-antagonist pairs and used nerve signals that were still undamaged after amputation. The nerves were connected to muscle pairs grafted from other parts of the body into the amputation site. Muscle pairs work together to mimic natural muscles and when the brain wants to move a limb, the grafted muscles contract. The agonist extends and sends feedback to the brain about how the muscle moved and how much force was used. In the test with rats, the research showed that when the rats contracted one muscle, the other would move the opposite direction and send sensory information to the brain. Stretched muscles send neural feedback that allows amputees to feel where their limbs are in space. The researchers suggest that the human brain would be able to learn how much control it has when moving artificial limbs. This surgical technique could work for all amputee types, according to the researchers. The muscles grafts would be 4-by-1.5 cm in size. 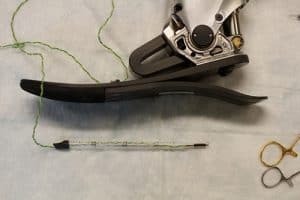 “For almost any amputation scenario, as long as we have a little bit of the healthy nerve left, we can take that and put it into regenerative muscle grafts. We can harvest these muscle grafts from almost anywhere in the body, making this applicable to a large number of cases ranging from trauma to chronic pain,” Srinivasan said.